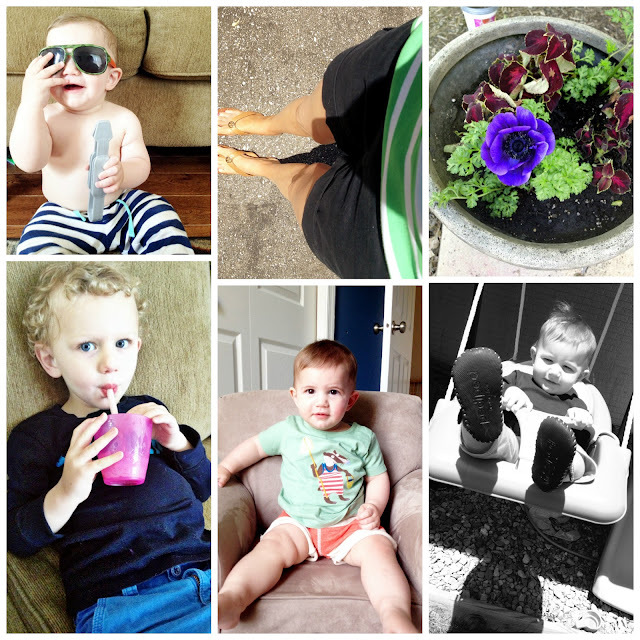 I Love You More Than Carrots: Life Lately. "Shup-Up, Mom!" Things are great here. They really, really are. I mean, of course they could always be better, right? It could be warmer outside (hello, schizo Mother Nature), it would be awesome if I wasn't up to my ear-balls in laundry every godforsaken day, I would appreciate it if my ankle would heal one hundred times faster, etc. but those are all trivial things. Aside from all of that? Things are really, really good. Which might explain why I haven't had a whole lot to say. I haven't been baking up a storm so I don't have any recipes to share. I don't really have any wisdom regarding how (or how not) to raise your children to impart and you certainly don't need me jumping on any soapboxes. So? We've kind of just been kickin' it. M Family style. We're busy and I mean busy with a capital "B". I just finished co-hosting my sister-in-law's first (of many) baby showers this summer and I had so much fun exercising a little creativity around a very simple primary color theme. We had a blast showering her and baby Gavin with love and presents and I cannot wait to squeeze his little guts come July. 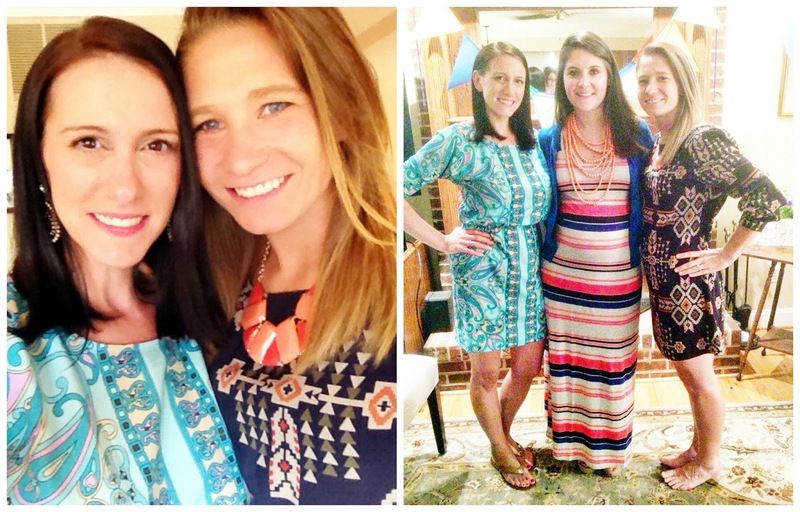 You see, she's due with G Baby just one week before Carter's birthday and each time she posts a pregnancy update, I can't help but think back to each of my summer pregnancies. And within seconds I'm reminding myself of this year's goal. It's a good thing I'll get my baby-fix in the form of a brand new squishy nephew in just a few short months. With Maclane's first birthday party right around the corner, I can now dedicate 100% of my energy to planning his Where The Wild Things Are party. I apologize to my husband in advance as it looks like we may be eating tuna noodle casserole and Kraft Mac-n-Cheese the last two weeks of this month as I may have already spent some grocery budget on party necessities. Maybe. See my blonde-haired little sister-in-law up there? She was in a sorority in college and therefore she is a creative genius when it comes to all things crafty and party decor. She's come up with some amazing ideas so here's to hoping we're able to pull them off in a little more than 3 weeks. Maclane is days away from walking unassisted. Sure there is a small part of me that wants to push him over and sit on him so that he stops growing up so damn fast but at the same time he's at such a fun age that I can't help but love what each new day brings. Exploring, moving, interacting, dancing- I just love it so, so much. Can we take a minute and talk about how much fun it is to have a small human living with you who has his own thoughts and opinions? I'm serious. Carter is pretty much the coolest, most hilarious kid I know and I find myself waiting with baited breath to hear what's going to come out of his cute little mouth next. We've been waiting patiently for Carter's vocabulary to explode and over the course of the last several weeks it has just exploded by leaps and bounds. Our pediatrician was never concerned (are they ever?) and always said we would evaluate him at his 3-year appointment in July if need be. He always said the "right amount" of words and was stringing two to three of them together at a time but wasn't really ever conversing with us or parroting what we said consistently. With a recent onslaught of ear infections I was concerned that his ears might be the cause of his delayed speech but it turns out he was just waiting until he was ready. I would like to point out that I really did have faith in him all along. I really felt like he was just waiting until he was ready. Well, we're at the point now where I rarely have to translate for him and he's speaking in full sentences and asking questions and pretending like he runs the show. Which, if we're being honest, he pretty much does. Just don't tell him that. I, on the other hand, really have to watch my mouth now that I have a little Repeater Ronny running around the house. Just the other day, my SIL and I, along with our friend and babysitter, had been having a rather loud conversation at the kitchen table. Apparently we were too loud because without warning Carter shouted at the top of his lungs, "SHUP UP, MOM!" At first I thought I was hearing things but after he repeated himself a few more times, I tried to stifle both my laughter and mortification by ignoring him. Then I decided I should probably tell him that we don't speak like that and it's better to say, "Please be quiet." If only "Please be quiet, Sheepie" was as effective as "SHUT UP, SHEEPIE!" Believe me, I take full responsibility for that one and after sharing the story with my mom she did say, "Well, Ash, it could have been much worse" and she's right. If you follow me on Facebook then I'm sure you've already seen this hilarious and slightly inappropriate video of Carter sharing his new favorite number. I have no idea where he comes up with these things but EVERY day EVERY thing is all about this number. We spent this past weekend finally planting bushes in our front garden beds, the same beds that have sat empty since we bought our house three years ago. It was getting to the point where our house looked rather vacant from the front and truth be told, it was a little (okay, a lot) embarrassing. Especially since our neighbor's lawn resembles a manicured golf course. My thoughts on shopping for bushes and shrubs? They're awfully expensive for just sticks and leaves. Happy Mother's Day to me. The Straw-ber-itas flow freely after five (okay, seven o' clock at night) even if the laundry isn't folded and has sat in the same baskets in the same spot on our floor for the last several days. I haven't baked a single dessert in weeks which probably accounts for the fact that I can wear the same pairs of shorts I wore my freshman year of college. Our days are full of fun and laughter (even more so now that we have an almost permanent moon bounce in our backyard) and midday 90's music dance parties. When we're not grilling dinner on the deck with the boys, we're down the street making the most of our kid-filled nights with our parent friends in the neighborhood. Life is good. No, actually, life is great, even if my toddler does tell me "SHUP UP!" at least 69 times a day.